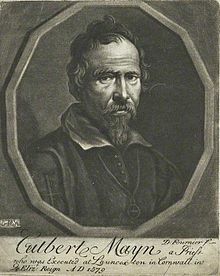 In 1570 Cuthbert Mayne (pictured below) became a Catholic and attempted to convert the Cornish. 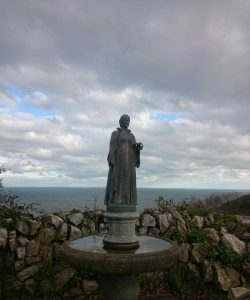 He was arrested for the crime of being a priest and on November 12 1577 was executed at Launceston – he was drawn and quartered and a portion of his skull was kept in the Carmelite Convent at Lanherne in Cornwall. 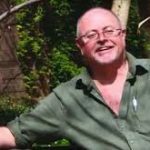 As a warning to others, his body parts were distributed around the country – and instructions were given for a “quarter” of his body to be put on a pole at an obscure place called “Torquay”. This appears to be the first mention of the name ‘Torquay’ for the town. 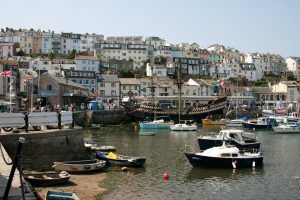 The name began as Torrequay, then Torkay, Torkey and Tor Quay – it being the quay of the village of Torre. Though Torquay is a fairly modern town, the other two settlement of the Bay are much older. 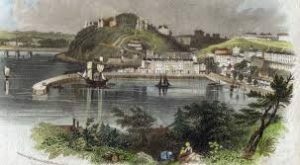 Formerly written ‘Peyton’, ‘Payngton’, and ‘Paington’, Paignton is derived from ‘Paega’ which is an Anglo-Saxon personal name, with ‘ton’ a settlement. 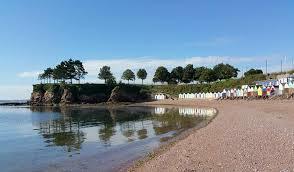 Paignton, therefore, appears to be an Anglo-Saxon community – ‘Paega’s settlement’. 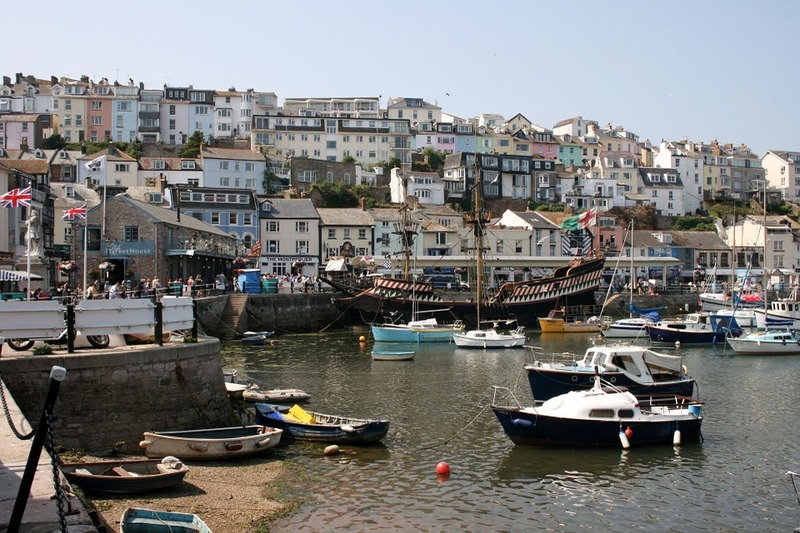 On the other hand, it is thought that the name ‘Brixham’ comes from Brioc’s farm. ‘Brioc’ was an old English or Brythonic Celtic personal name and ‘ham’ is derived from Old English. So, is Paignton originally Anglo-Saxon and Brixham originally Celtic? Such coexistence is supported by old records that show that the Celtic language was still being spoken in the South Hams in the Middle Ages. The term ‘ton’ refers to a settlement developed from an enclosed farm. Hence, Upton (upland farm); Cockington (the farm of Cocca’s people). Combe means’ in a valley’, so: Ellacombe (elder tree valley); Watcombe (Wat’s valley) and Babbacombe (Babba’s valley). And there are other old names that have lost their meaning over the years. Daddyhole, for instance, was the haunt of the Devil – ‘Daddy’ being Old English for Devil or demon. Caves or holes were often associated with the entrance to Hell and the residence of the enemy of mankind. There’s an old Torquay folk tale of a woman who sold her soul to the Devil as he patrolled the Plain with his satanic dogs, and her despairing cries can still be heard on the wind swept cliffs. 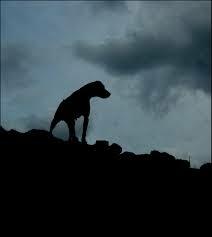 Similar legends – this time of subterranean malicious Pixies – surround Kent’s Cavern. yet, despite fanciful explanations for the naming of Cavern, the designation Kent’s probably originates in the Celtic ‘canto’ meaning ‘border’ or ‘coastal’. Hence, in Devon we have Kenn and Kenton – the County of Kent and Canterbury have the same source. Under Daddyhole is the sea arch oddly known as London Bridge – it has been known as such since at least 1769, before Torquay as a town came into being. It may well have been named by someone who saw the original medieval London Bridge over the Thames with its narrow and dangerous arches (pictured below). 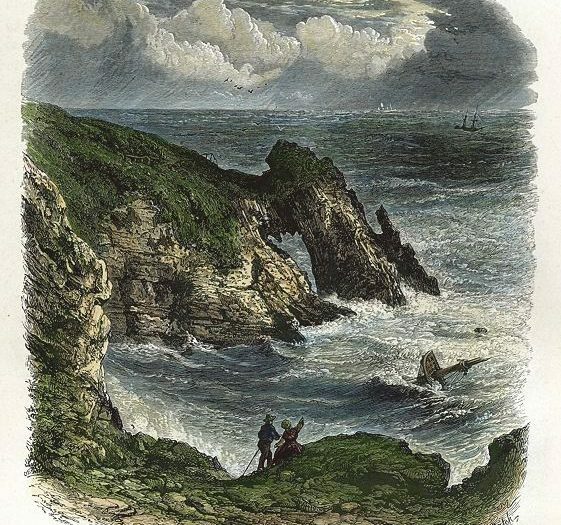 Further along the coast is Corbyn’s Head, from the Saxon ‘corvenasse’ (cut off headland) and the Norman ‘courbe (crooked headland). Then we come to Preston, or ‘preosta tun’ – the priest’s farm – possibly a mission station set up to convert the locals to Christianity. 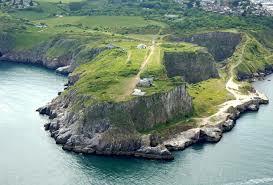 The two wings of Torbay are, as we locals all know, Berry Head and Hope’s Nose. Berry Head (above) comes from the Old English ‘byrig’ or stronghold, referring to the Iron Age hill fort on the site – now mostly destroyed by the construction between 1794 and 1804 of fortifications to protect the Torbay naval anchorage against threatened invasion by the French. Originally, Hope’s Nose was probably ‘Hops Ness’. The root word is Old English and so probably dates from before the fifteenth century and is derived from ‘hop’ or ‘hoop’. This refers to the area enclosed by its hooked shape which was a temporary anchorage for ships caught in south-westerly gales. Later maps would have fixed namings as they had evolved over time – hop came to be Hope. 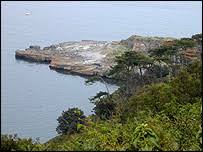 Nose has the same root as Ness, a headland or promontory, as in the Ness at Teignmouth.